The Academy orchestra performs Baroque concerti with virtuoso violinists and the viola. A special treat will be a debut performance by Lily Smith of the Telemann Viola Concerto. A member of the Academy for several years, Lily recently joined the viola section of the professional Camerata Chicago orchestra for its series with international violinist Shmuel Ashkenasi performing the Mendelssohn Violin Concerto. The Academy orchestra captures the essence of spring with a light touch of Vivaldi. Amelia Piscitelli and Kevin Shi will play the Vivaldi Concerto for Two Violins in D, one of our favorites. This is Kevin’s debut as soloist. The Handel Concerto Grosso Opus 6 No. 1 will complete this concert in Baroque style with double dotted flare. A wonderful string orchestra concert with a virtuoso soloists performing baroque concerti and lyrical classics. 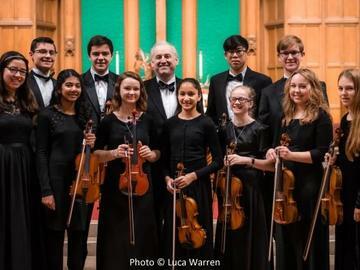 The Camerata Chicago Academy Orchestra is Ensemble-in-Residence at Gary Methodist Church, Wheaton.